Kevin McCarthy was on fire for Kilcummin. AN ABSOLUTELY FRANTIC first half in Croke Park paved the way for Kilcummin’s All-Ireland Intermediate win. The ball was in the net for the first time after a mere two minutes. Kieran Murphy’s mark from a Naomh Éanna kickout starting a Kilcummin move that was worked through to Kevin McCarthy – a late replacement here – and just as it looked like he was taken out he dished off to Matt Keane to roll home. Naomh Éanna missed a gilt-edged chance when Eoin Nagle’s fisted pass across the goal was palmed onto the crossbar by Ethan Gibson and they were in further bother on seven minutes when McCarthy netted the second goal, leaving them 2-3 to no score in front. Playing no sweeper was to their detriment as McCarthy worked his way through the entire full-back of markers before the first half was out. Naomh Éanna came back into it with huge cheers greeting the next two points from Odhran Eastwood and they had a goal when a flighted delivery from Conan Lyttle was flashed to the net. Manager Frankie Fitzsimmons made two subs to stem the flow and they had another goal from Ruairi Scott to creep two points in arrears. After that, Kilcummin manager Willie Maher identified that Naomh Éanna running game was effective and so made his son, William junior a sweeper to clog up the middle. Kilcummin’s third goal came from the penalty spot, Kieran Murphy sending sub goalkeeper Michael Morgan the wrong way after original goalkeeper Paddy Flood was black carded for upending Noel Duggan. Two brilliant saves from former Kerry goalkeeper Brendan Kealy kept Kilcummin in control of the second half as Naomh Éanna tried a fourth marker on Kevin McCarthy, who finished with a tally of 3-7, all from play. -An earlier version of this report described Kevin McCarthy as a former Kerry player. This has now been corrected. Email “McCarthy kicks 3-7 as Kilcummin cruise to All-Ireland title in Croke Park”. 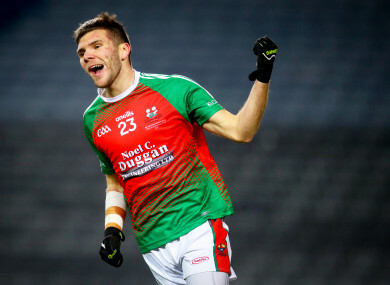 Feedback on “McCarthy kicks 3-7 as Kilcummin cruise to All-Ireland title in Croke Park”.